In a pre-show interview at Louis Vuitton headquarters, artistic director Virgil Abloh mentioned that the rainbow hues seen all over the show came from the idea of white light hitting a prism and dividing into its component colours, giving birth to this highly instagramable runway set up. Every single thing present at the show held some sort of symbolism to Abloh’s journey within the fashion industry, including the matching graphic tees show-goers received at their seats. 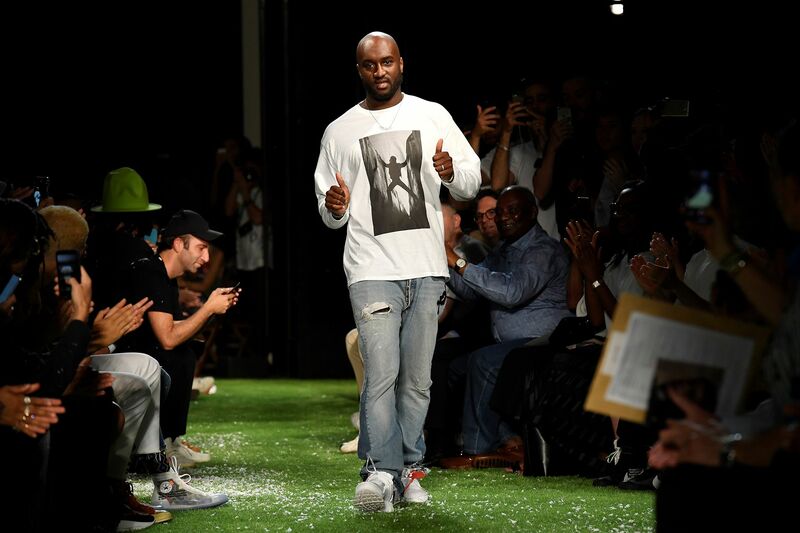 As someone who has never attended fashion school, Abloh started his career with a graphic t-shirt, and wanted to give a shoutout to that. As Louis Vuitton’s first black artistic director, many lauded the brand as taking a step towards inclusivity and diversity. While Abloh shies away from talking about politics and race, the show’s diverse casting of models spoke volumes, featuring an ethically diverse mix of models as well as Abloh’s personal friends. As unisex dressing starts to enter the mainstream, Abloh’s celebrity female friends like Rihanna, Kim Kardashian and Bella Hadid came by decked in the menswear collection to show their support, showcasing that both men and women can successfully pull off his designs. As a house that started out with luxury accessories, the highlight of the show was the hybrid bags he created. Bags, wallets and cardholders were fused into clothing as holsters and harnesses, giving Louis Vuitton’s classic accessories a utilitarian twist. Mark our words, these pieces are bound to sell out when it hits the retail floor. Hypebeasts, you’ve been warned. Say what you want to say about Kanye West, but when Abloh took his finale bow, West leapt from his seat in the front row to embrace his close friend and creative collaborator to share an extremely emotional hug that made us feel all the feels. We’re not crying, you are.